Come to Harlem and stay at Lita's New York Apartments in a spectacular sun-filled parlor suite in a privately-owned landmarked brownstone (without elevator) as your vacation home. Experience spacious rooms with original oak floors, original wood details and 12 foot ceilings in an open loft like style. The suite has a soothing color scheme with beautiful and comfortable furniture. 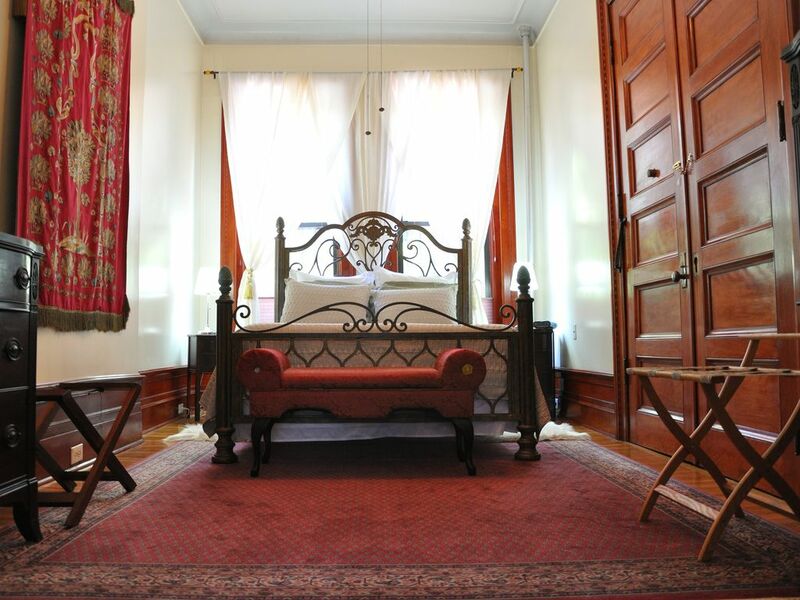 The suite consists of a one bedroom with a Queen size tempur-pedic bed and antique dressers. The livingroom has a Queen size sofa bed and flat screen TV with cable and wireless internet access. It also consists of a fully equipped kitchen with stainless steel appliances and all utensils to cook a four course meal, dining table set, which can be expanded to accommodate more guests, if necessary. A full size private bathroom with tub/shower combination is in the unit. Management lives on site and is available to help you with all your questions and needs. Nearby Highlights: The suite is located near the Convent Baptist Church, where you can listen to one of the best gospel choirs. If jazz is your style, St. Nick's Pub is a few blocks away. Take a look at The City College of New York with its Gothic architecture and the prestigious Columbia University, all nearby. The Hamilton Grange house is located at St. Nicholas Park, and River State Bank Park, Riverside Park and Central Park are all within walking distance and/or a few minutes away. The world-famous Apollo Theatre, President Clinton's office and the New Red Rooster, which was just visited by President Obama, is one-stop away on the subway. Come and see all the architectural facades in Harlem, the beautiful Riverside Church and St. John the Divine Cathedral. A 24 hour supermarket, local grocery stores, drugstores, 24 hour health club, restaurants are all within walking distance. Nearby transportation: Your vacation home is just a few steps to major transportation, subways and buses. It is conveniently located via subway to most tourist attractions. It is on an Express stop where you can hop on and in 15 minutes are in downtown, near Times Square, the infamous Broadway - Theatre district, and the Empire State Building. You can walk two blocks and take the Broadway bus and see all of Central Park and Fifth Avenue, while only spending one fare. How affordable is that! LaGuardia Airport is a mere 8 miles away and John F. Kennedy International Airport is 19 miles. Payments: Payments can be made through PayPal. Building is over 120 years old with a lot of history to it historic landmark brownstone with a warm modern feel. Metro station is less than 3 minutes walk from our location, where you can take the A and D train which is express to Time Square within 10-15 to most of the tourists attraction in NYC. The B and C trains are local all within minutes to the famous National History Museum in Central Park and many more tourists attraction. Very clean. Easy in and out. Wonderful hosts. Very clean vintage apt. Great location. Would stay here again. Great place just STEPS away from subway! Beautiful clean flat with lovely owners. Would stay there again. Teresa was a gracious and terrific host! Incredible apartment, as advertised. Location is really good--easy access to great restaurants, subway, other conveniences. The building is beautiful. Loved the Sugar Hill place across the street for breakfast/coffee in the morning. everything was great. We will be back! We were very pleased with Lita's Parlor. It was large, clean and had all the conveniences of home. It is close to the subway and this area has wonderful places to eat within walking distance. Harlem Public, The Grange, and Sugar Hill Coffee Shop are wonderful local places. Sugar Hill is right across the street! The best part is meeting Theresa; she is very kind and helpful. We were pleasantly surprised that even though it is on 145th street is was quieter than many hotels we've stayed in at other locations in the city. Comfortable in a great location! This apartment is spacious, beautiful and very clean. Theresa is a wonderful host, very friendly and helpful. The apartment is close to the subway and the neighborhood has everything you'll need for an enjoyable stay. The apartment is well equipped and comfortable. We enjoyed our stay at Lita's. The apartment is so very convenient to subway system and many local grocery stores, wine, sandwiches, etc. Quiet and comfortable. Theresa assisted us with transportation to the airport, which was an immense help to us. Thanks so much. The apt is only a block from a relative, so we will surely stay again. Thank you for being one of our best guests! We hope you enjoyed your stay at Lita's New York vacation rental, and looking forward to your return. Your review are highly appreciated! Nearby highlights include the Convent Baptist Church, Abyssinian Baptist Church, City College, Columbia University, Hamilton House Grange, the word-famous Apollo Theatre and the Schomburg Library.